Drain and rinse all the beans and corn. In a pot, heat up the olive oil and spices on medium. When it becomes fragrant, add the beans, corn, Braggs and water. Stir to incorporate, then put a cover on it and move on to the salsa. Roughly chop up the tomatoes, peach, and cilantro. Place it all in a food processor with the juice from a lime, apple cider vinegar and salt. Blintz for 15 seconds and set aside. Chop up the 6 dates into little pieces and add to the simmering pot of chili, stir in and remove from heat. Then cut up an avocado into little pieces for topping. 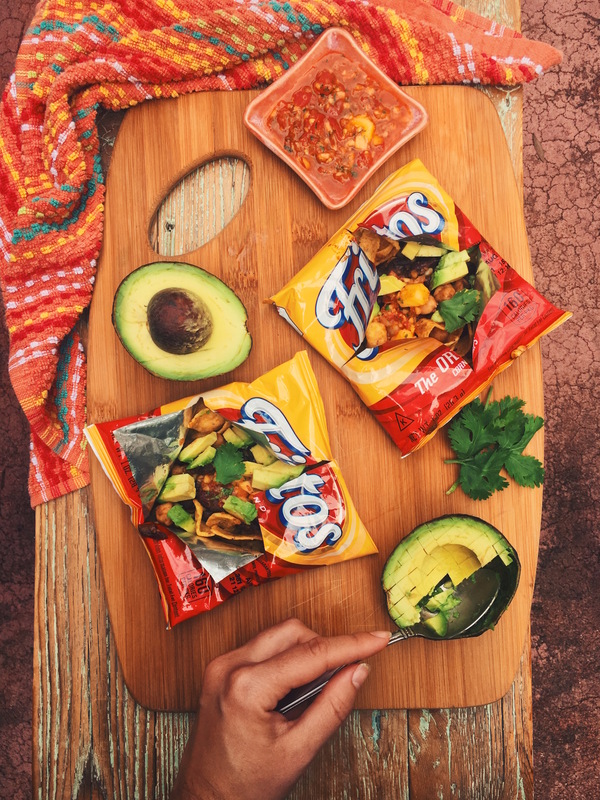 Cut your Frito bag(s) with 2 slits making a cross. Spoon in chili, salsa, and avocado for topping.